You’d never know this is actually healthy whole wheat pumpkin bread! Just a few swaps & adjustments to a standard pumpkin bread recipe yield this moist, lightened-up bread that’s secretly lower in sugar. 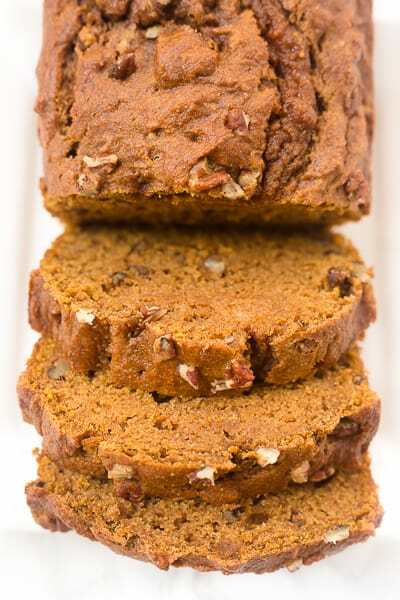 The Internet may not need another pumpkin bread recipe, but I have to share this one since it’s the best healthy pumpkin bread I’ve ever had. 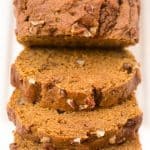 When I started making my own pumpkin bread several years ago, I experimented with my normal quick-bread healthy baking substitutions to see what’d work best. After some trial and error, I’ve developed a healthier recipe that tastes just like standard pumpkin bread so you’d never know it’s lightened up. I’ve made this no less than 15 or 20 times. It’s a fall/winter go-to treat and it makes a great gift. First, I’ve reduced the amount of sugar by one-third. Years ago, I learned that in most recipes, you can reduce the sugar by one-third without a noticeable difference. Second, I’ve substituted unsweetened applesauce for half of the oil, and I’ve used a healthier oil (coconut or avocado oil both work well) instead of the standard vegetable oil. Third, I’ve used whole-grain flour, sprouted spelt flour, and whole wheat pastry flour with success. You can also add chocolate chips, white chocolate chips or cinnamon chips, or you can use chopped walnuts or pecans. I like all of the above, so I use whatever I happen to have and always sprinkle extra on top before baking the bread. You know, for the aesthetic. One awesome thing about quick breads is that they freeze really well. This recipe makes two loaves, so you can eat one right away and freeze the other whole. Once the bread is cooled, just wrap in aluminum foil or plastic wrap and place in a freezer-safe bag. Or, you can cut it into slices and freeze each individual piece. Then, the night before you want to eat it, just pull a piece out of the freezer and place it in the fridge. In the morning, you’ll have a single serving of fresh pumpkin bread waiting! If you try this healthy whole wheat pumpkin bread, feel free to let me know in a comment or take a picture and tag me @livbane on Instagram. Hope you enjoy! Mix dry ingredients in a large bowl: flour, sugar, baking soda, salt, and pumpkin pie spice. In a large measuring cup, stir together oil, applesauce, water, and eggs. Add wet ingredients to dry ingredients. Incorporate pumpkin puree and vanilla extract, stirring until just combined. Grease two 9x5 inch loaf pans and distribute the batter evenly between the two pans. Sprinkle extra nuts on top of loaves before placing in oven. Bake at 350 degrees for 50 to 65 minutes, or until a toothpick inserted in the center of a loaf comes out mostly clean with just a few moist crumbs. Tent with foil during the last half of baking if top is getting overly brown. Let loaves cool in pans for at least 30 minutes before removing. I need to make pumpkin bread ASAP now! Love this pics too! I love playing around with recipes, and it looks like you achieved an awesome result! I love pumpkin bread, and one of the few ways I actually like white chocolate is with pumpkin things – all the spices counter the sweetness a little. That said, I also love dark chocolate chips in my pumpkin bread (surprise, surprise!). That’s such a good point! I’m typically not a fan of white chocolate by itself since it can be really sweet (which is why I love dark chocolate- the more bitter, the better! ), but I think the spices balance out the sweetness of the white chocolate really well. Oh yeah, you can play the “sliver game” with a loaf of pumpkin bread allllll day long! I love how vibrant this bread looks. The orange hue instantly makes me excited to try this out. Also, white chocolate chips? Sold. Sold. Sold. Love this! There’s nothing like bright colors in food when they come from all natural sources- gotta love pumpkin! This looks awesome!! I love how you made it so much healthier (but still super delicious!) …and wow! White chocolate chips/ cinnamon chips!?! What a fun idea!! <3 Great recipe girl!! this looks so moist and delicious! I love the addition of walnuts! Yum! This bread looks so moist and flavorful. I hate when my bread comes out dry. I’ll have to try this! And I love regular chocolate chips, or pumpkin bread absolutely slathered in peanut butter, but I am up for trying your recommendation of white chocolate chips! I am completely the same on the love affair with Fall and a recent realisation that pumpkin things are sooo good (I was put off by a nasty pumpkin dish I had some years ago and only had the courage to try it again in one of Arman’s (The Big Man’s World blogger) recipes this year). However, I now have 3 cans of pumpkin puree (thank you WholeFoods for the 3 for £5 offer!) 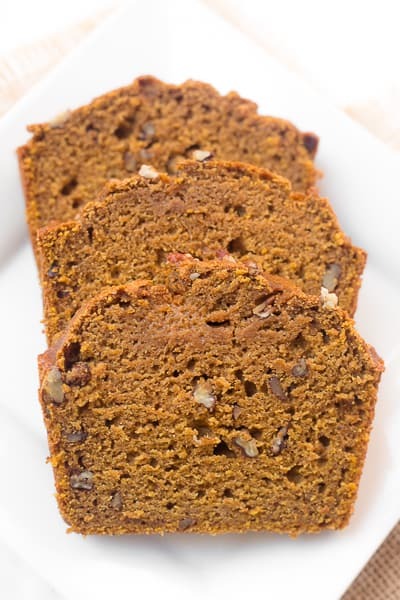 and this pumpkin bread recipe looks too good not to try! Fall is just THE best and strangely enough, I have actually only come round to enjoying pumpkin this year as it is something I had also avoided for ages after a bad experience in the past. However, I have now fallen in love and since I have 3 cans if pumpkin puree in my cupboard (thank you WholeFoods for the 3 for £5 offer! ), this recipe looks like a delicious way to use them! Apologies for the double post- my computer said the first one hadn’t gone thorough and as I was rewriting I got thinking about chocolate orange instead of chocolate coffee! Oooh that tip about white chocolate chips is so true! Also BUTTERSCOTCH chips in anything are great. I just made brownies and put candy corn M&Ms in them. Those are white chocolate m&ms with a candy corn tasting shell. Talk about NEVER STOP EATING them!!! I’d say I’m a scone person. This month at work we have cinnamon scones (with cinnamon chips) and I am in LOVE! I have not made bread in a while because it makes a lot and I get tired of it after a couple days. I think a single serve pumpkin bread would be awesome! I so want a slice of this right now! 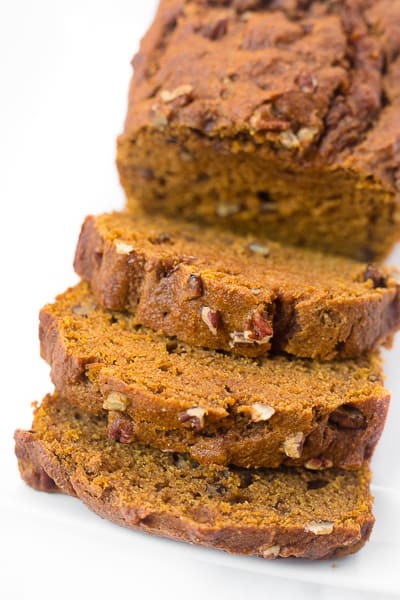 I love pumpkin bread and I’m so happy to have a lighter version – looks delicious! Haha! I do love muffins but I agree, they’re a bit harder to eat! (And I really just love the muffin tops haha). I knew I picked up 6 jars of pumpkin for a good reason yesterday! Excited to use this recipe for Joshua’s pumpkin bread this week. Thanks for sharing, Liv! This looks absolutely delicious! Your pictures make it look even better. Printing this out so I can make it later! Thank you for the recipe! My HS boyfriend and I thought we had discovered the “craziest” combination when we would buy these pumpkin spice chocolate chip cookies in the grocery store. Little did we know that they were already on trend! Oh my – this will definitely be on my next to make recipe once I have the courage to make banana bread! I think this would taste really good with some raisins thrown in – I don’t know about you but I love pumpkin and raisins. It’s just something about that combo! I bet raisins would be great in this! The combo of cinnamon + raisins is hard to beat. Excited to see your new site- heading over to check it out now! Exactly! I love love cinnamon and raisin – it screams FALL! 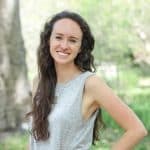 I am excited for you to see the new site! It honestly gives me happy vibes every time I log on and get to work on the site and I am loving learning what it means to run my blog and website! pumpkin and banana bread are my faves! this recipe sounds great Liv! Wow! 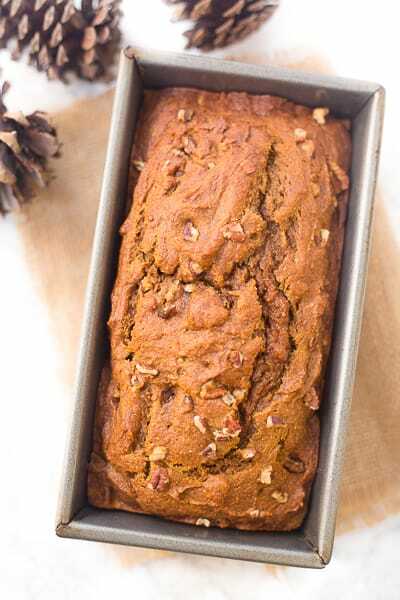 The pumpkin bread looks delicious!I know you always make healthy recipe but this one looks really awesome! Why should I not try! Just made this into muffins! Baked for 25 minutes and they came out perfect and yummy! I used 3/4 cup brown sugar instead of 1 1/2 cups sugar and it turned out great! Thank you! !